I‘ve mentioned, often, how much I love the comfort and ease of living in the twenty-first century…though I’m addicted to all things Victorian (to a point). I like everything from a climate-controlled home to my dishwasher to an automatic garage-door opener. I like ice cubes in my water, all year ’round. I like trusting that the water coming out of my tap is drinkable. I remember filling ice cube trays to freeze, then collecting the ice in a bin to make more…and fretting over making enough ahead of time for social gatherings. Today’s ice-makers are nearly standard with refrigerators, so this opening statement on The Farm Collector’s amazingly thorough article about the ice-harvesting industry of the nineteenth century resonated with me! 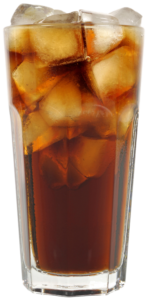 Ice: Today we take it for granted as we go to the refrigerator and stick a glass under the chute of the automatic ice cube maker. It wasn’t, of course, always so easy. Some of us old-timers remember having to actually jerk the lever on a metal tray to break loose the cubes. 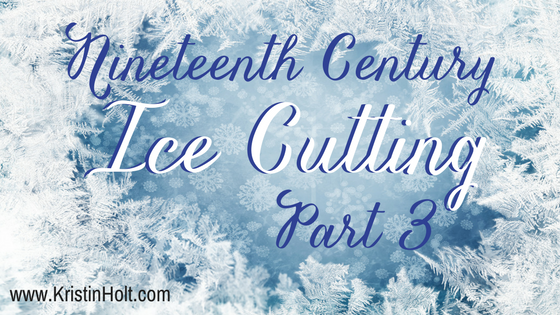 Before the days of mechanical ice-making machines, folks had to rely on Mother Nature for ice. Archaeologists have determined that the early Greeks, Romans and Chinese stored ice and snow in caves to use during warm weather. These early people even discovered that ice helped preserve food. 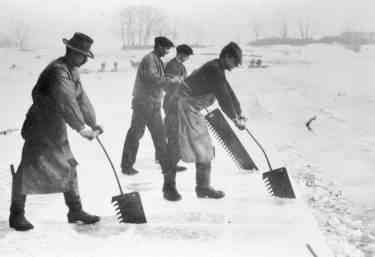 In northern climates where winters are cold enough to freeze thick layers of ice on ponds, lakes and rivers, most farmers once had a small icehouse and cut enough ice during the winter to last them through hot weather. But what of the southern gentleman wanting to enjoy a cold mint julep on his veranda, or an English viceroy drinking a brandy “peg” while being fanned by a Hindu houseboy in the sweltering heat of Calcutta? How about the New York City housewife who wanted to keep her milk from spoiling? Tens of thousands of new refrigerated boxcars began plying the nation’s railroads during the 1870s. How were they to be kept supplied with ice when they needed to be refilled every 250 to 400 miles? 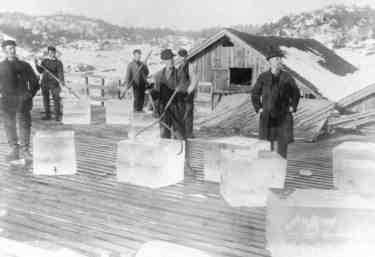 Cutting ice into blocks was done by hand with metal saws. Image: Canal Museum, United Kingdom. 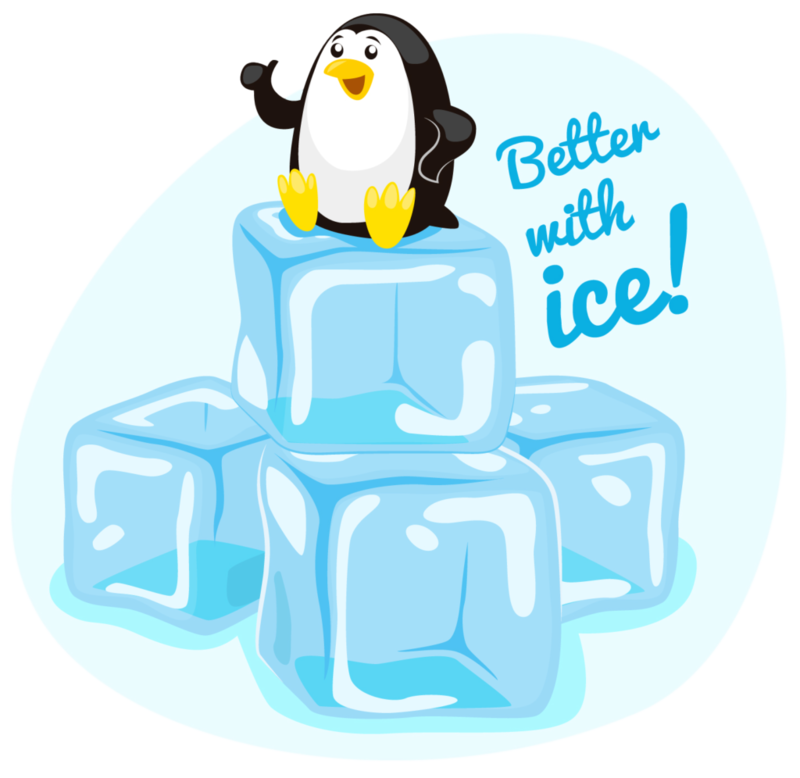 We might joke about salesmen so good at what they do they could sell ice to Eskimos…as in the ability to convince someone they needed a product they didn’t know they needed…or already had within easy reach. In the case of ice, the peoples of Calcutta had lived, well, for longer than anyone could remember, without ice. They couldn’t be convinced they wanted it, much less needed it. Until one determined American Victorian entrepreneur shipped a melting cargo into every warm climate nation he could manage, and went about trying to sell his wares. The revolutionary technology was tested when Tudor shipped ice on a 16,000-mile journey from Boston to Calcutta in 1833. Despite spending four months at sea, most of the 180-ton shipment arrived in India intact. 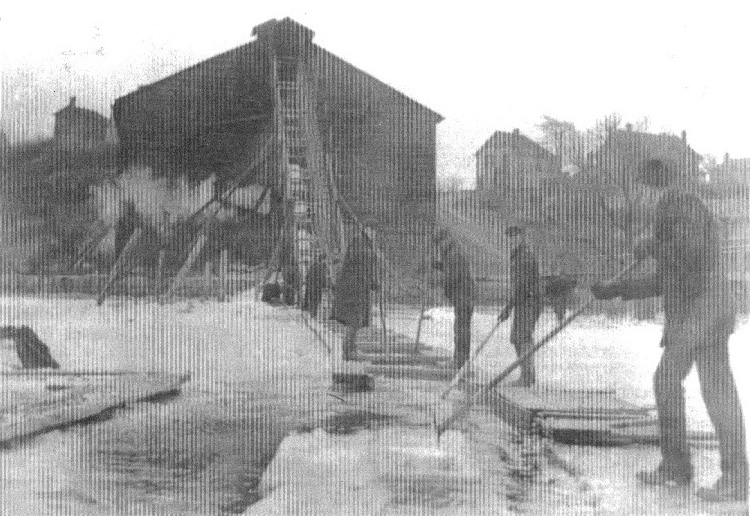 The crystal-clear New England ice caused such a sensation in Calcutta that within three days residents commissioned the construction of an icehouse. 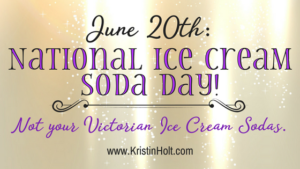 Finally, the determined Tudor had proven it was possible to mass-produce a supply of natural ice and successfully deliver it anywhere in the world where there was demand. The ice trade boomed, and Tudor became the industry’s frosty tycoon. When measured in weight, cotton was the only “crop” shipped in greater supply by American ships in the years before the Civil War. India was the Ice King’s most profitable realm, a market so lucrative that it allowed Tudor to pay off more than $200,000 in debt he had accrued on a disastrous coffee speculation and fulfill his wealthy dreams. 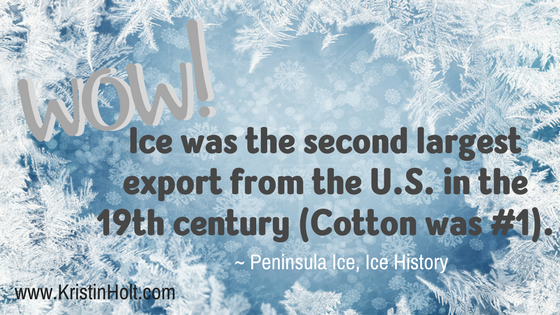 The ice trade became a bedrock of 19th-century New England commerce. By 1856, nearly 150,000 tons of ice a year left on ships from Boston to 43 foreign countries, including China, Australia and Japan. Aided by the railroads, domestic consumption was even greater. When Tudor died at the age of 80 in 1864, he was a millionaire. Nineteenth Century Ice Harvest. Image: Courtesy of Library of Congress, via Star Craft Custom Builders of Lincoln, Nebraska. Yonder, near the farther shore, where the ice-boats are flitting to and fro and the skaters are wheeling about, there is a narrow strip of ice that the wind has swept clear; but over the larger portion of the frozen expanse the snow has become packed down and partially amalgamated with the mass below. My most recent blog post (of an 1871 publication) covers the process from beginning to end, covering essentially the same information as this 1894 resource. 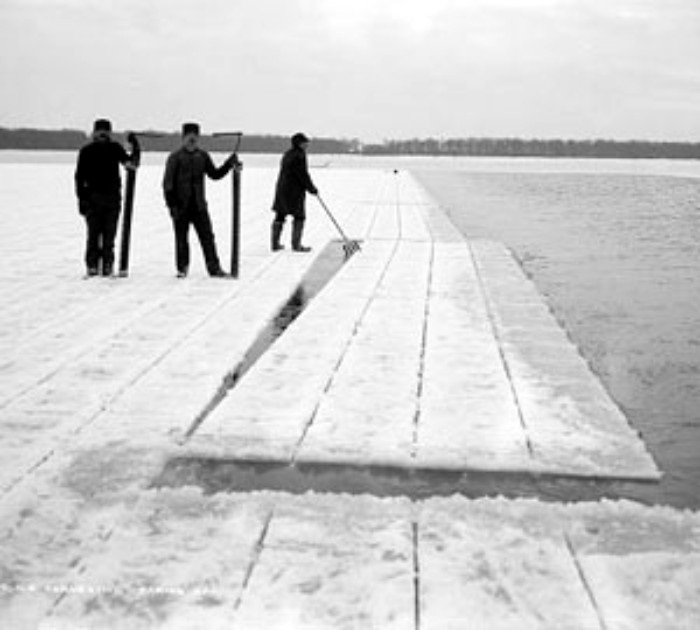 Once the ice had been cut, the ice was handled with metal tongs, hinged in the middle. Similar tongs were used for lifting blocks with a crane. Image: Canal Museum, United Kingdom.